I love making trips to spend time with my side of family in my hometown. We made an impromptu visit to see them over the weekend and we had a great time catching up. Whenever my family gets together it’s always a big deal since there are so many of us now. I always look forward to having dinner together and one dinner that we can all agree on is breakfast for dinner. We had a huge breakfast for dinner the other night and I am still thinking about how great it was. 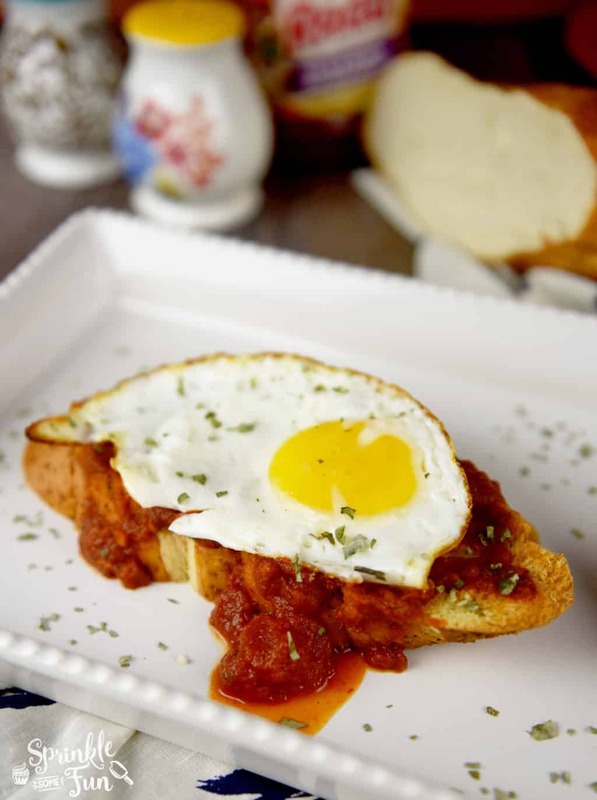 This Italian Breakfast Toast is something that I knew my family would love and reminds me of home! It can be enjoyed for breakfast, lunch or dinner! 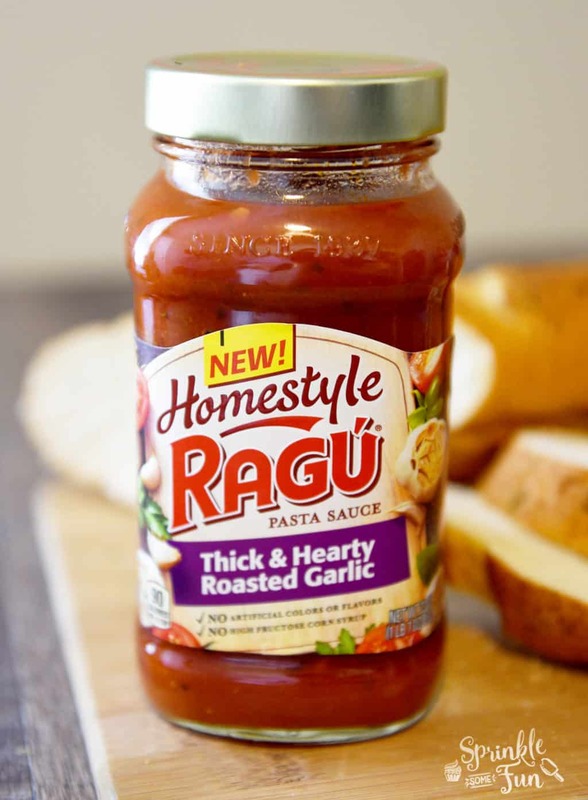 I used RAGÚ® Homestyle sauce in the Thick and Hearty Roasted Garlic style. This is a thick sauce that perfectly hugs pasta and also goes great with this breakfast toast. It has a bold flavor because it’s peeled, chopped and simmered to layer and build the flavor. RAGÚ® Homestyle sauce has no artificial flavors, artificial colors or high fructose corn syrup. I love the taste and the thickness. 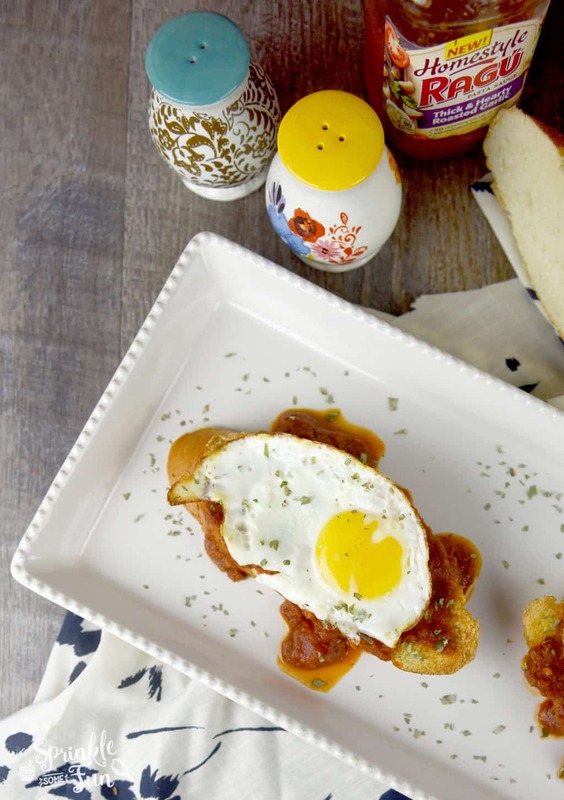 I love our breakfast at home tradition and this Italian Breakfast Toast is one of my new favorite breakfast foods. There is just something about having eggs with a meal that makes me think breakfast. 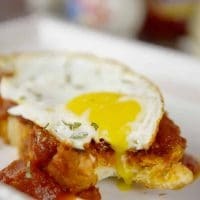 I actually love the taste of the Ragu sauce with the egg, which is not surprising, because tomatoes always taste great with eggs! 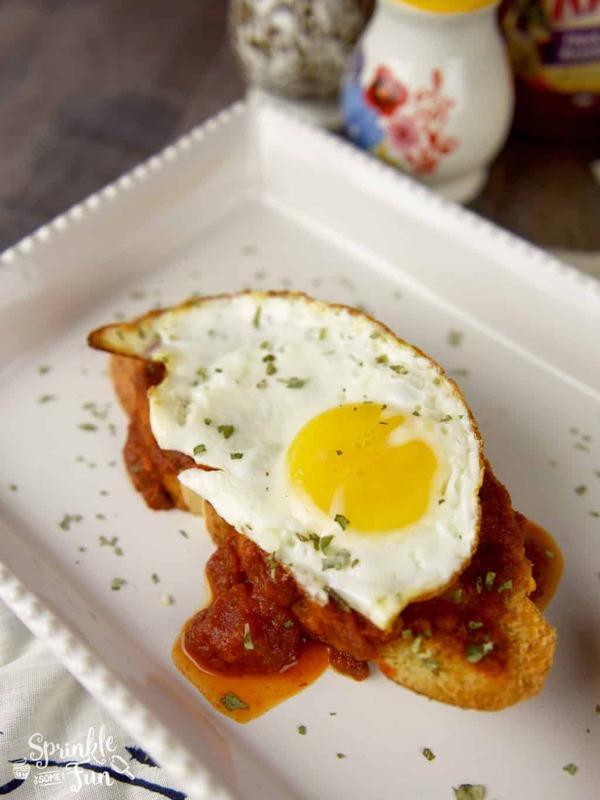 This Italian Breakfast Toast will really kick breakfast up a notch or “breakfast for dinner” if you love breakfast for dinner as much as my family! Preheat oven to 400 degrees. Meanwhile heat a skillet with a little oil and heat the Ragu sauce in a medium pot according to jar instructions. Butter the bread and toast in the oven for 10 minutes or until the toast is browned. Fry the eggs in the skillet on medium heat until they are as done as you like them. 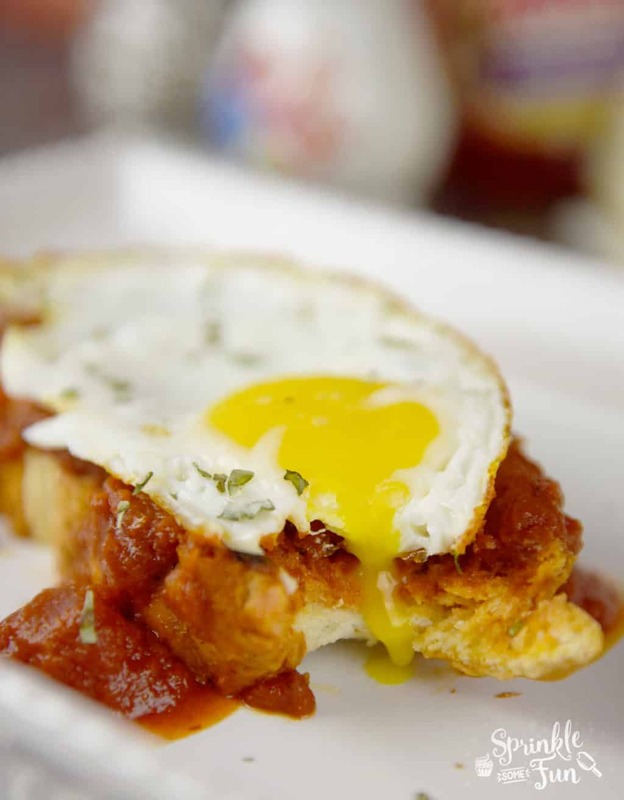 Pour a generous amount of the Ragu sauce on top of the toast and then top with the fried egg. Sprinkle italian herbs if desired before serving. Enjoy! Visit the campaign landing page to learn more about the new line of RAGÚ® Homestyle sauces and find a taste of home. What a great breakfast! I would never have thought to put sauce into a breakfast dish! YUM! Thanks, Angela! 🙂 It was yummy! Oh yum! I love a savory breakfast and this looks fantastic! What a delightful combination! I’ve never heard of Italian breakfast toast, but I clearly need it in my life because it sounds delicious and simple to make for a crowd! And I have no doubt my family would love this dish, too. Well done! Thanks, Erin! It’s really easy and a nice break from usual breakfast foods. What a unique recipe! I have never seen the combination of eggs with pasta sauce, but it looks tasty!